You can expend very little effort in spotting a technique such as Takedown #3 and its family of variations across every part of the martial arts world. 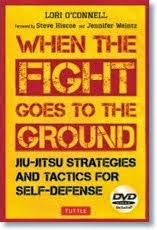 Of course, readers may refer to it by a different name than the one we use in our Jiu Jitsu curriculum. The effect is like a fast and heavy broom, sweeping aside whatever happens to stand in the way. As beginners, we were taught to grab the opponent’s shoulder with, let’s say, our right hand….pull back hard…while sweeping the back of her leg with our right leg. Again, practical and not so complex at all. Like a tricky old school yard leg trip, in fact, my little students have plenty of fun with this technique. Little Peyton will grasp her training chum’s left shoulder with her right hand, and as a way of distracting her, she’ll point up at the ceiling and say” “Watch the birdie!” Just as her partner gazes up, Peyton sweeps her off her leg. Hearing this, Christopher tris to one up Peyton by grasping his brother Benjamin’s shoulder and say: “Watch the flying pizza!” and so on. There is no shortage to their inventions. Their innocence is endearing. Older kids will learn to apply the technique from various angles; they’ll also pepper their sparring with this and any number of other takedowns. And they’ll often grapple with each other after the partner is swept of his feet or the partner who has fallen will retaliate with a barrage of ground fighting kicks. They enjoy taking a basic technique and bending it to serve the situation they find themselves in. I can’t forget the first time I saw what we call Takedown #3 applied from the front – or from any other angle for that matter – using the Northern Praying Mantis form Bung Bo Kuen. In the form, the heel hammers the floor hard, and the sound comes off like the shot of a rifle. The mantis claw comes across from the opposite side of the leg and slices whatever it can get hold of. This movement is repeated from the opposite side, so you immediately get the sense that this left-right sequence is part of a cluster attack, along with elbows, punches, low kicks, etc. Sharp and brutal, fighting such as this is ever remote from what Peyton and Christopher do in class. But that’s the nature of Mantis. Here’s a watchful tip for readers – different systems will use different hand signatures and methods of sweeping which seem to be different from Takedown #3 but in reality aren’t. Mantis will use the mantis claw; crane may use the beak of a crane; Karate may use the side hammer fist; Tai Chi may use the forearm or even the elbow; Tiger Claw may use…guess what?...in a sideways fashion. Yet the effects remain the same. Now let’s switch over to Sensei Murray Mahoney and our arch-villain, Anthony Fritz, who’ll take us through the basic procedure of Takedown #3. They’re back by the fence again, and since it’s a week later, we’ve lost, what?, a minute of daylight, and since it rained the day before, the local mosquitoes have also asked to participate in a meaningful way. We’ll first take the beginner’s step by step approach, starting from Anthony’s right side. 1. Mahoney grasps Anthony’s left shoulder with his left hand. (Some folks will take this opportunity to push the partner slightly forward and then proceed to yank him sharply back). Mahoney will now pull Anthony backward as his left leg sweeps Anthony’s right leg. Really, you can, if you wish, pull straight back however we’ve found that by pulling backward – and downward at the same time – unsettles the partner balance much more dramatically. The partner’s head tends to drop sharply downward while the upended legs swing up into the air. Here’s another trick – yes, pull back…and downward…but also…pull his shoulder down toward your left hip. Mahoney does this all the time, and he finds that the partner’s head lands alongside his left leg while his legs swing harmlessly away from him leaving the partner in a highly vulnerable position. Of course, this is the ideal ending. As the cliché goes…you can have your cake and eat it too! 2. That’s the basic takedown, sweet and simple. Now the training begins in earnest, as well as the improvisation that goes along with the training. I’ve learned to appreciate that a Takedown is a weapon. Therefore, as a weapon, Takedown #3, should be applied from any position, 360 degrees, under any and all circumstances. 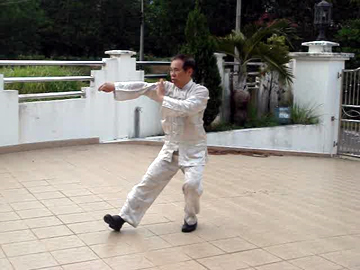 In fact, as Mahoney shows us, you can do things such as slicing the arm backward across the throat as you sweep; come in from the front or the sides, sweeping from that particular angle of approach, while slicing the head from back to front; driving across from your right against the inside of his left leg while slashing his neck from left to right. 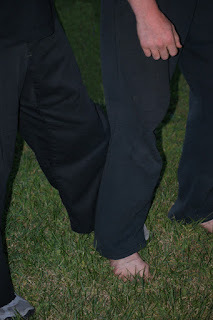 Another mode of training I can suggest is to have your partner grab you in different ways: bear hug from the back; head lock from the side; wrist grab from the front…or your partner can try to jangle your nerves by jabbing at you from the front or performing a barrage of low roundhouse kicks to your legs. 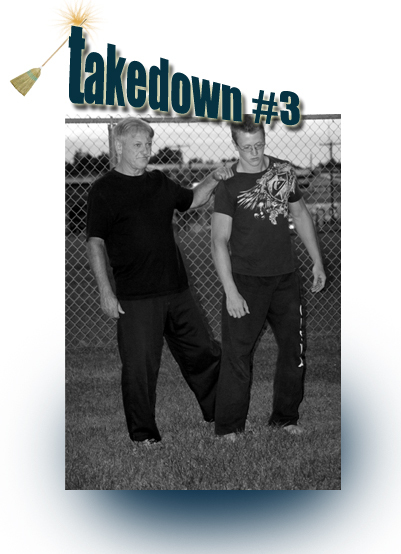 No matter which, your Takedown #3 will eventually make its appearance. 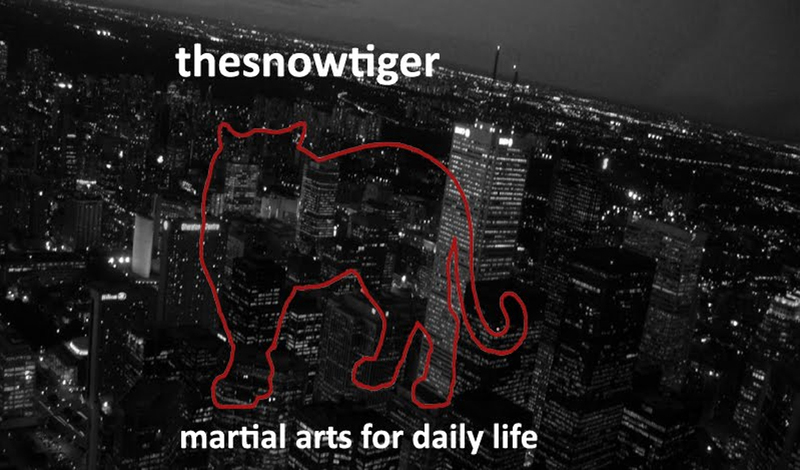 You may have to sidestep those jabs, you may have to block his roundhouse punch, you may have to counter the thrust of a knife attack…put you will use the takedown to place him on the ground.